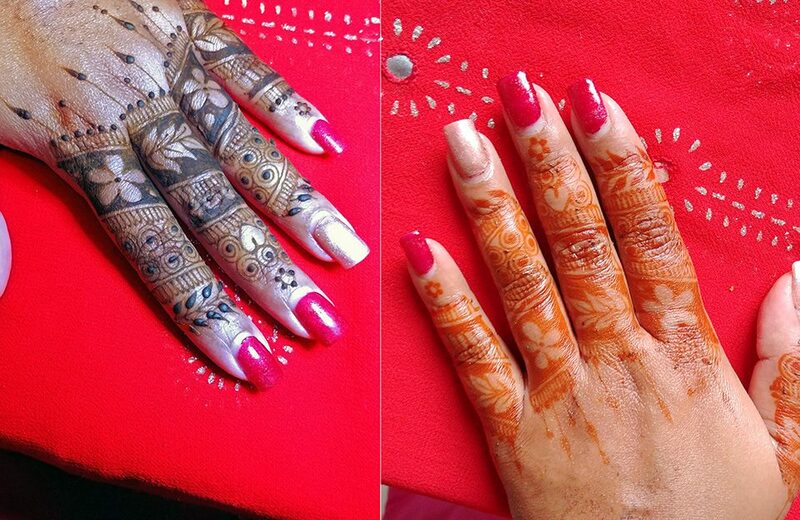 Henna (or Mehndi) is an ancient art form, traditionally practiced during a variety of celebrations and still is. Stemming from India, SE Asia, North Africa and Middle-Eastern regions. Henna is produced from a small shrub called “Lawsonia Inermis.” The leaves and twigs are gathered and ground into a fine powder, which then mixes with various ingredients to form a paste. 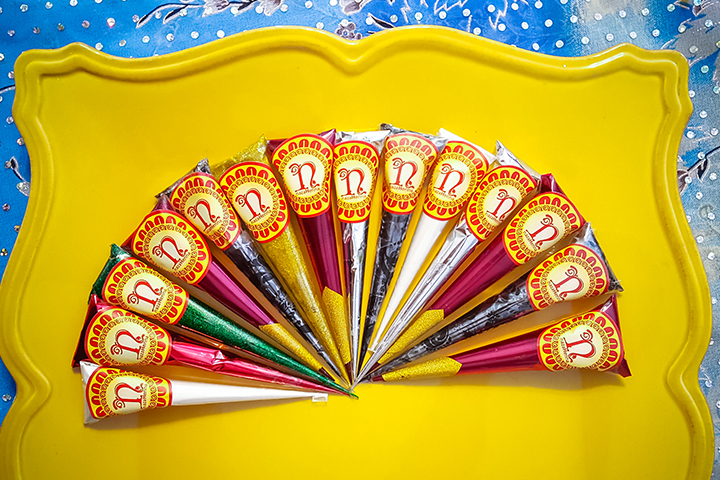 The henna mixture is applied to the body in the form of beautiful patterns via small plastic tubes or toothpicks or jack bottles with a fine tip. Henna stains the top layers of your skin. The final pigmentation ranges anywhere from a reddish-orange to a reddish-brown color. Today, this art-form has evolved to a more contemporary style and applies to the body in all different locations for many occasions globally. Jagua is a South American fruit extract that is also used in the same manner as Henna to create body art. This fruit has been used for body ornamentation and medicinal purposes in many areas of South America for centuries. While henna tattoos associate with Indian, African and Middle Eastern cultures, jagua body art was invented by Circum-Caribbean tribes and the indigenous peoples of the Amazon region. Jagua can be applied directly in the juice format or mixed into a gel and applied through a tube like henna. The Jagua dries and sets for 2-3 hours and is then washed off with soap and water thoroughly. The stain at first is barely visible, we call it “ghosting” because it comes back dark and rich over 12-24 hours and yields a bluish-black color. Jagua is NOT black henna and contains no dyes or PPD. Note: Because Jagua is a fruit extract, if you are allergic to or have a sensitivity to berries, a dot test should be done to make sure no reactions occur. WHAT’S THE DIFFERENCE BETWEEN HENNA AND MEHNDI? 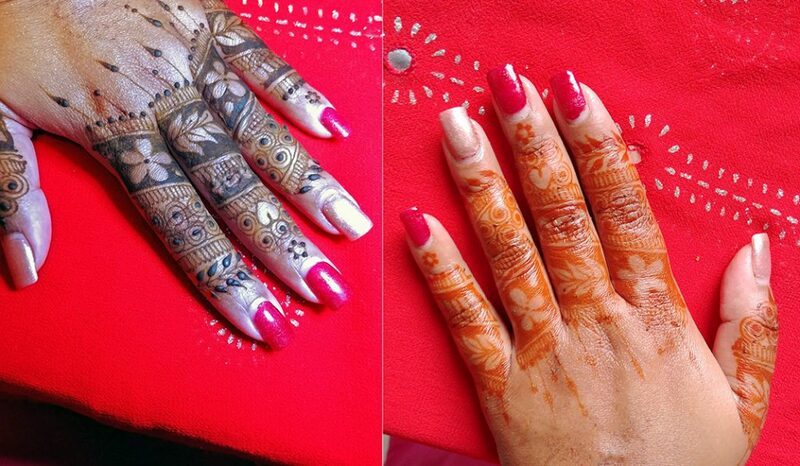 Henna and Mehndi have no distinction. They are terms that are interchangeably used to describe the same product. Generally, it’s a cultural distinction where Western cultures refer to it as Henna and Asian cultures refer to it as Mehndi. HOW SHOULD I STORE HENNA AND JAGUA? Henna and Jagua stores in the freezer away from light when not in use. When ready for use, the product is thawed for 5-10 minutes at room temperature or until the paste is soft enough for application. The color of Henna fades gracefully over 5-7 days, varying with proper care and body heat of each individual. Jagua lasts slightly longer at 7–10 days. They are both very heat sensitive, so the warmer the skin, the longer-lasting the dye. Each person’s skin is different due to hormonal balances, pH, stress levels and diet, causing different results from place to place and day to day. 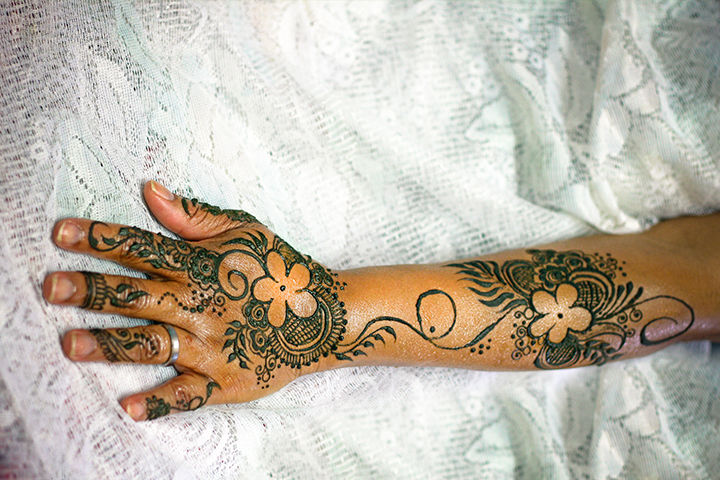 Henna is used traditionally for decorations on the hands and feet, but it can be applied anywhere on the skin or hair. The stain is darkest and lasts longest on the palms of the hands and the feet. If applied on the hair it dyes it to a reddish-brown color. On black hair, it gives a shimmer and highlight. The pure form of Henna is not harmful at all. In fact, it has healthy benefits. It cools and protects skin from sunburn and strengthens hair and adds a polished shine. Most of the products found in stores, however, are typically mixed with harmful additives and chemicals. Which is why we continuously try to educate about natural henna. Click Here to view the chart that quickly compares natural henna vs chemical henna. White henna does not dye the skin. It is adhesive based, meaning it’s like a temporary tattoo and uses skin safe waterproof “glue.” Depending on where on the body it is applied and how well maintained, it can last 1-3 days. It is removed with some oil, soap and water. White henna is great for special events and occasions. We DO NOT use black henna! Black Henna is NOT Henna! There are several things marketed as “Black Henna”, and some things believed to be “Black Henna.” Some are very dangerous and use PPD, which can cause permanent damage to your skin, from blistering, and possibly lead to cancer.